Also, the article understates the contentious nature of the “low alcohol vs high alcohol” camps within the wine world – the intra-industry vitriol launched between the two opposing camps is the sort of stuff you can’t read out load in front of the kids. Take care: wines are getting stronger | Life and style | The Observer. When I visit a new vacation spot, particularly one as captivating as Provence, I come home laden with gifts and souvenirs that remind me of my time away. My favorite ones are long-lasting and usable on a regular basis. For example, I once stayed at a hotel where the in-room toothpaste was flavored with grapefruit. Though odd at first, I soon began looking forward to it. So on my way to the airport I stopped by a Drug Store and bought two or three tubes of the stuff. For months I was reminded of France at least twice a day! If you like this idea, but aren’t sure you want Grapefruit-flavored dentifrice, you’ll find that a good regional cook book is an excellent alternative. It can provide a lifetime of experiences that will pull you back into vacation mode from the time you begin shopping for ingredients until you finish drying the last dish. But finding a good one can be a challenge – even if the translation is adequate, old-world cooks often under-communicate techniques that they’re taught shortly after suckling but are unfamiliar to those outside the region. And books by New World authors often miss the authenticity you fell in love with in situ. Enter Millo and Todorovska, the authors of “Provence Food & Wine, the Art of Living”. Born and raised in Provence, Millo is a talented photographer (not surprisingly, the photos in this book are captivating) and enthusiastic advocate of his region. His partner in this project is a Chicago-based cookbook author, food and wine educator, and owner of the food, wine and travel company www.oliviacooking.com. Together, they’ve put together a book that is part travel brochure, part history book, part photo book and part cookbook. All-in-all, it’s a nice way to spend an evening or two. The recipes offer some easy dishes ideal for light mid-week meals as well as some more complex meals that are a better fit for a weekend, if your schedule looks anything like ours. But over-all, this is the best collection of regional dishes I’ve seen in my two decades of casual searching for such things, and for this I thank the authors. As for the wine, the book comes with a helpful map of the Provence AOCs, and covers each one in enough detail to belie Todorovska’s wine educator chops. But the authors primary passion is clearly Provençal Rosé. And who can blame them?! These wines are dry, perfect for a hot summer day and, due to their good acidity and mid-weight body, pair beautifully with a huge range of dishes. Plus, they’ve been enjoying ~40% YOY sales growth over the past few years. So yes, they are very worthy of emphasis. If you were in pursuit of the coarse, spicy reds from this region, you’ll find they’ve gotten rather short shrift, however. In summary, this book is not for everyone, but if you love Provence, if you love the food and wine of the region, and you want to bring them into your home on a regular basis, I don’t think you’ll ever be disappointed that you separated with the reasonable $20 fee – available at Surrey Books. P.S. No compensation was received in exchange for this review. A complimentary copy of the book was provided by the publisher for my consideration, but the choice to review it was entirely mine. I just received a PR release about “The 101 Best Wineries in America” from The Daily Meal. Of the nation’s 8,000+ U.S. wine producers, the top 101 were selected by surveys from American wine and food professionals (methodology details can be found below). So I was pleased to see the list contained NINETEEN of the wineries I’ve introduced to my club members! If I had as much skill in selecting stocks I could retire and tour the vineyards of the world year-round. Hell, I could own a couple dozen. “Call me Mr. Foley”. Until then, I’ll spend my day copying the top 10 wineries (below), followed by the publisher’s notes and methodology. Note, of the 101 top wineries, 24 do not meet my wine club’s criteria for price or production criteria. To see the full story and list of all 101 wineries from “The Daily Meal”, click here. For more information on my wine clubs click here and discover your next favorite! While California remains indisputably the wine capital of the country, the number and variety of truly beautiful wines being made in America has grown exponentially in recent years: wine is now produced in all 50 states. This list is largely a reflection of that, and celebrates those wineries that are simply doing it best (many of which are quite unexpected!). The wineries on our list were nominated by experts in the field: the wonderful sommeliers, wine writers, chefs, and restaurateurs who were kind enough to gift us with their opinions about wineries around the country. After their initial nominations, these experts returned to vote on the wines based on the three values we deemed most important: wine quality, consistency, and value. Poring over the voters’ results allowed us to shape the final list of wineries you see here. We all know the significance of certain dates. July 4th. December 25th. June 28th. Oh yeah. Big day, historically speaking. The day TV Evangelist Robert Schuller attacked a flight attendant (1997). And when Houston Astro’s Craig Biggio got his 3000th hit (2007). It was also the day the first woman was admitted to the Air Force Academy (1976). Like I said – a big day. And it’s about to get bigger. On June 28th of his year, at Mendocino’s charming Little River Inn, the 11th vintage of “Coro Mendocino” enjoys its coming out party. Sort of makes all that other stuff pale by comparison. Little River Inn, Mendocino Coast. Location for the 2011 “Coro Mendocino” release party. Never heard of Little River Inn? It’s a place worthy of a weekend. Super Wife and I have celebrated a number of anniversaries here, and we can’t recommend it highly enough – Chef Marc Dym earned five stars before settling at this resort hotel on the Mendocino coast, and his food alone is worthy of a full blog post. But I digress – let’s get back to the wine. Consider yourself fortunate if you’re familiar with the wine, as not many are. It’s a cool concept – Old-World meets New-World wine making and marketing. This year, the Coro label has been granted to eight wines produced by eight different Vintners. It is also the Spanish/Italian word for Chorus, a community of synchronized voices that is similar to the concept behind Coro Mendocino – winemakers coming together to set standards for a class of wines to represent their wine region. Last year’s Coro wines stand at attention during their release party. Zinfandel, the county’s heritage variety, must make up at least 40% and no more than 70% of the blend. No wine can be released to the public before all the winemakers in the consortium have deemed each entry as worthy during a blind-tasting. So June 28th marks the first public tasting of these eight different “Coro” wines. The entry price tag is steep, but before you move on to the next thing in your inbox, note that the $500 fee includes dinner for two AND a bottle of each of the eight Coro wines. ‘Second City’ Bests New York. Again. When I lived in Chicago, we got used to being the “Second City” – the derogatory honorific granted the city that became accustomed to eating New York’s dust. This position in history was often reinforced in daily life – Chicago has to celebrate independence day on the 3rd of July because New York has their desired fireworks production company under contract for the 4th. Even the city’s best known and most prolific comedy club is named “Second City” (though comedy fans familiar with its alums would be hard pressed to find a better launch pad in New York). Even New Yorks sports teams dominate their Second City competitors. Of course, every team dominates the Cubbies. But then, Cub fans don’t go to see the team, they go to see Wrigley. But Chicago’s second place is about to move up a notch in at least one important category – culinary tourism. Chicago already has two important feathers in its culinary cap (toque?) – Grant Achatz’ restaurant “Next” was named the top restaurant in 2012, and chef Paul Kahan was named “Best Chef” in 2013. It’s about to add a third. It was announced earlier today that next year’s James Beard Awards (best chef, best restaurant, etc.) will be moved from New York to Chicago. It’s the first time in a quarter century the awards have not taken place in New York. Read the full story, here. Posted byDave the Wine Merchant May 20, 2014 Posted inFood and DrinkTags: chicago, culinary awards, james beard, james beard awardsLeave a comment on ‘Second City’ Bests New York. Again. What is Wine & Cheese Without a Good Cheese Board? I was approached recently by a friend asking me to purchase a cheese board made from a re-purposed wine bottle. Which lead my sophomoric mind down the path of cheap and easy jokes about how to keep the cheese from rolling away. Unspoken silliness is a constant source of personal amusement. But as you can see (Left), the bottles have been heated, flattened, and adorned with appropriate attire. I’d be thrilled were you to buy one here for the absurdly reasonable price of $20. Proceeds go to support CFS. The friend who sent me this request is married to a close family friend. We were thrilled for them when they first met, then married, the two of them being a natural pairing. They shared a love for active outdoor activities, so vacations were spent kayaking or climbing or hiking or cross-country skiing. We were never surprised when a postcard arrived from yet another exotic global locale. That is, until several years ago, when their active lifestyle came to a crashing halt. She had contracted Chronic Fatigue Syndrome (CFS). At its worst, it was all she could do to walk from the couch to the kitchen, a short trip that required an Everest-mounting effort. It was horrible just to hear about, and I can’t imagine what it is like to live through. All the more so because of her natural inclination for an active lifestyle. When she asked if I would support CFS research by purchasing one of these cheese boards, I said “I’ll do better than that – I’ll help get the word out!”. It’s the perfect stage for highlighting the best cheese at your next wine and cheese tasting. And it’s the only cheese board I know of that helps seek a cure for such this life-altering disease. Buy one here, just $20. Posted byDave the Wine Merchant May 19, 2014 Posted inCurrent AffairsTags: CFS, cheese board, chronic fatigue syndrome, re-purposed wine bottle, wine bottle cheese boardLeave a comment on What is Wine & Cheese Without a Good Cheese Board? From the director of ‘Chocolat’, produced by Spielberg and Oprah, and acted by Helen Mirren (with a French accent, no less! ), this new movie promises to provide rather predictable plot lines and to be a bit over-produced (it’s from Dreamworks). But food becomes the lead character and ‘The Hundred-Foot Journey” deserves viewing by any food enthusiast. The contemporary plot involves an upstart Indian Chef whose family moves in across the street from Mirren’s Michelin-starred restaurant. The ensuing clash is predictable but fun to watch, as the young upstart brings a freshness to the French foodways and traditions, and as he adapts his own style to create a fusion of the two. Did I mention Helen Mirren plays lead? So it’s automatically on our watch list, French accent or not. And I’ll enjoy each of the beautifully-shot food scenes, given the high expectations set by foodie director Lasse Hallström in his classic ‘Chocolat’. As if his credentials weren’t enough, know that NY Chef Floyd Cardoz (Tabla, North End Grill) consulted on the food (see recipe, below) and that Cardoz was a leader in the New Indian Cuisine scene – the marriage of traditional Indian spices with Western technique. Try the recipe at home, and if you like it, try the movie too! Tom Stevenson, a prolific wine writer and respected authority on the subject (including The Sotheby’s Wine Encyclopedia! ), is known for tomes whose pages are mostly flipped by those training to be wine experts. But he’s taken a different tack with his latest book – ‘Buy The Right Wine Every Time‘ (Released on March 4th, 2014). He’s written this book for those new to wine. I wish I’d had access to such a book when I was a newbie, some 35 years ago. It appeals to anyone who needs some wine competency but doesn’t have the time or inclination to pursue it as a hobby. I don’t know such people, but I hear they exist in large numbers and that some of them are actually quite pleasant to be around. Tom doesn’t waste any ink introducing the conceit for his book. In just a few pages he introduces his reader to the book’s intent and organization. Then he dives in. The first 25 pages show his top recommendations by ~30 types of wine, using a simple ranking and 1, 2 or 3 dollar-sign indicator for rough pricing guidance. His top tier ($$$) indicates a cost above $25 (retail price, not restaurant), which may seem a rather low ceiling to fine wine buffs, but in reality such wines make up less than 4% of wine sold in the U.S.
Tom’s quick ranking-by-type then yields to the bulk of the book, which describes each wine in greater detail (and with extremely helpful label images – no mean feat when writing about hundreds of wines). Though the book will be a handy guide for those browsing through a wine shop, it’s just a bit too big and bulky to bring into a restaurant setting (unless available for mobile e-readers, which I don’t see anywhere – just yet). As for the hundreds of wines in the book, they tend to be global brands – those that are easiest to find in your local store. Which makes sense for guide book – what use would it be if you could never find the wines it describes? However, I’ve chosen a different wine life. To me, the most amazing and enjoyable part of the mondo vino is the small producer who’s ignored the siren call of ‘biggering’ production in favor of crafting a wine that makes a unique statement. Wine as art vs wine as widget. Such wines have little mass appeal and instead develop cult-like followings among a small but devout niche of wine lovers. If you worship at that alter, this book will not scratch your itch. But then, that was not its intent. And in fairness, it provides a useful launch pad for those who think they may become interested in such endeavors. 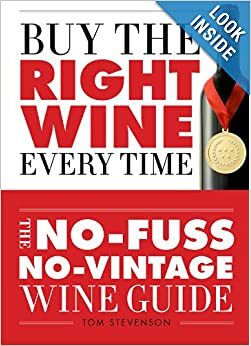 I recommend it for what it is – a useful guide for those new to wine and for those seeking some quick competency without investing much time or money to get there.